HARMAN Professional Solutions has debuted the AMX N2400 Series video encoders and decoders, the video-over-IP solutions delivering 4K content over Gigabit Ethernet networks with "near-imperceptible latency," according to the company. With support for 4K video at 60Hz and 4:4:4 chroma, the N2400 Series joins a lineup of cost-effective 4K solutions from HARMAN that enable businesses and active learning environments to bring ultra-high-definition video to viewers. "The 4K market is accelerating rapidly, and more businesses and institutions want to deliver top-tier video content to create the best possible experience for their customers," said Andy Whitehead, General Manager Networked AV, HARMAN Professional Solutions. "The new AMX N2400 Series enables universities, houses of worship, sporting arenas and corporations to quickly deliver true cinema-quality 4K video to hundreds of displays simultaneously." With N2400 Series encoders and decoders, users can instantly distribute 4K video without compromising quality. The new series uses JPEG 2000 encoding to deliver content at native frame rate and color space over cost-effective standard Gigabit Ethernet with just two frames of latency. With support for HDMI 2.0 and HDCP 2.2, the N2400 Series is compatible with all the latest 4K sources and displays. N2400 encoders and decoders are easy and cost effective to integrate with existing video-distribution infrastructures. Because the N2400 Series can be PoE+ powered, the new encoders and decoders operate by either standard 12VDC power, or by a simple Ethernet connection from the local network switch. N2400 encoders and decoders also use the same control APIs, software, and easy-to-use web interfaces as existing AMX Networked AV solutions, making integration fast and intuitive. "The new N2400 Series joins a growing family of 4K Ultra HD over IP solutions from HARMAN that provide flexible and highly scalable networked-AV distribution, including the NMX-ENC-N2412A stand-alone encoder, the NMX-ENC-N2412A-C encoder card, and the NMX-DEC-2422A stand-alone decoder. 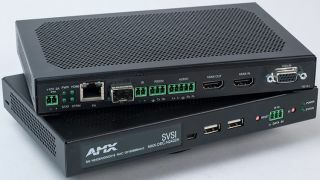 Alongside the AMX N2300 Series, which distributes 4K30 4:2:0 video over GbE, AMX N2400 encoders and decoders represent class-leading Networked AV products that enable businesses and institutions to reach customers with top-quality content, faster than ever before," the company stated in an ISE 2017 press release.